Pacemakers or hangers-on: it is something universal. Hooligans, people celebrating carnival, bikers ignoring traffic lights, or happy-birthday-to-you-singers, all can be divided along the same line. Carillon friends are no exception. Some of them are always busy organizing things, many of them are happy – consciously or unconsciously – to go with the musical flow. The other day I was present at a summer afternoon recital in the south of our country. At one side of the tower a small group carillon friends were listening attentively in the large green refectory garden, at the other side hundreds were enjoying food, drinks and some rags of the singing tower. Multiplying the number of listeners on each side of th tower with the amount of concentration might very well give the same number. Who am I to decide which one of the two groups was doing the right thing? Would it not be better to try and connect the pacemakers and the hangers-on? In this newsletter you find announcements and reports of activities that will lead to new connections: examinations, concerts, our volunteer (welcome!) and the casting of new bells. Next to that, of course, no harm is done if the pacemakers at the one side come over to the hanger-on on the other, to make them join. Ignoring a red traffic light is so much nicer in a well motivated group. The same goes for singing at a birthday party. And for enjoying bell music. I wish you a beautiful carillon summer! 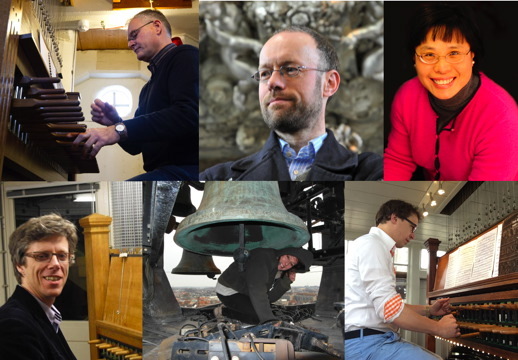 On Tuesday, June 23th at 11:45 hrs., Jan-Geert Heuvelman, student at HKU Netherlands Carillon School, will give an exam-concert on the Eijsbouts Carillon in the Tower of Our Lady. One of the events of the 26th Carillon Week Den Bosch was an improvisation contest on two carillons in two rounds, called the Battle of the Bells. The winner was Vincent Hensen, student of the HKU Netherlands Carillon School. During the coming summer, Gilde Amersfoort and the Netherlands Carillon School will again organise four concerts around the Belgian Monument, preceded by a ramble. During this ramble, which lasts for 45 minutes, a guide tells something of the history of the Monument, which was given to the Netherlands by Belgium after the First World War. After this, a student from the carillon school will give a concert. True to tradition, one concert will be given by pupils of the BCN, taught by Mathieu Daniël Polak. The rambles begin at 14.00 hrs. and the concert at 14.45 hrs. After the concert, the audience may climb the tower, where the carilloneurs will give explanations and information. For more information on the Gilde Amersfoort, click here. Many people have responded to our quest, December 2014, for a volunteer. Some months ago Mieke Lanen-Vos has taken up some work at the Netherlands Carillon Center. My name is Mieke Lanen-Vos. I studied Art History in Utrecht. As an art historian I've been volunteering for some fifteen years at the library of the HKU University of the Arts Utrecht, in the department Visual Art and Design. Until my retirement I was working at the faulty of Chemistry at the Utrecht University. The last years I was coordinator of the courses at the Juridical PAO in Utrecht. My work was at the Utrecht Janskerkhof, which is a beautiful location, as is the Amersfoort Grote Spui. I now help Gea van Veen and Simeon Bodden with small jobs, that would otherwise remain undone. I also play the viola in the Ad Hoc Orchestra of Utrecht. Contrary to what the name suggests, the ensemble exists 40 years now! At our last luster we not only edited a booklet with musical promenades, but also invited Arie Abbenes to play a special concert at the Dom tower. It made me delve into the profession of the carilloneur. The highlight for me came when I was asked to hand over the first edition of our booklet to louis Andriessen. Directly after that Arie played Andriessen's De Toren (The Tower). Too bad we are left without pictures, since the celebrations had to be carried out under umbrellas. In my personal life I'm a married woman with four children - all of them musically educated - and five grandchildren, the youngest being just a few weeks old. Friday 20 March was the day. At the Eijsbouts firm in Asten the E-flat bell for the Doesburg carillon was to be cast at 14 h. 30 precisely. It all started with 1500 kg red-hot bronze streaming out of the ovens into a large vessel. The vessel holding the liquid bronze, heated to 1100 degrees Celsius, was maneuvered toward its place above the mould. Tilting the vessel made the bronze stream into the hollow space, that was carefully moulded to the desired shape of the new bell for Doesburg. A large delegation from Doesburg had travelled to Asten, in order to be present at the event. They were Gosse Noordewier (vice mayor) and his wife, representatives of the Heritage Assocation Doesburg, the foundation Doesburgs Goed, the Rotary, next to sponsors, guests, and the board of the Doesburg Carillon Foundation. Of course Frans Haagen, city carillonneur of Doesburg, and his wife were present also. Haagen was one of the initiators of the project, that started somewhat over a year ago. The carillon is well supported by the city of Doesburg. It only took until October to raise € 40.000 and order the bell. May 5, 2015, the bell is inaugurated. That is exactly 50 years after the installation of the present carillon, which came to replace the 1653 carillon, of which little remained after the tower was blown up in 1945. Thus, 70 years after the destruction of the old carillon, the new bell comes to complete its successor, generally regarded as one of the most beautiful carillons in the Netherlands. T. Grootson, Secretaris Stichting Doesburgs Carillon. In 2014 the Carillon Foundation Woerden campaigned for a new E flat bell, to be added to the Woerden carillon. Fund raising proved quick and successful, and the bell (absolute pitch a1, c. 550 kg) could be ordered, thanks to the sponsors and the people behind the grandiose Carillon Feast, that was organized at the 50th anniversary of the carillon on September 13th, 2014. The E flat bell was cast at the Royal Eijsbouts Foundry in Asten in the beginning of February; in the end of March a good many people were present at its hoisting into the tower. Saturday May 30th there was a festive inauguration. Carillonneur Henk Verhoef played a program of classical and modern music and an improvisation, in which of course the new bell had an important part. After the concert a reception was organized for everyone involved. The new bell is the latest success of the Carillon Foundation Woerden, which in a few years time has become an important factor in Woerden's cultural life.